Vote: Would debt limit breach be catastrophic? President Obama is meeting with lawmakers about the government shutdown, starting first with the House Democrats. Could a deal finally be in the works, or is it even possible? 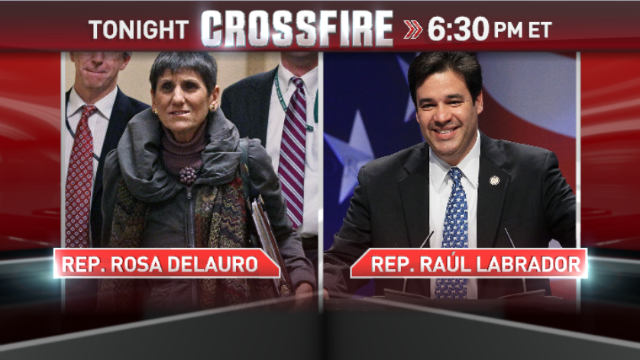 In the Crossfire, Democratic Rep. Rosa DeLauro, who attended the White House meeting, and Republican Rep. Raul Labrador, who wants the president to negotiate. Failure to act before the October 17 deadline to raise the debt ceiling could lead to the government defaulting and have negative effects on the U.S. and global economy. We want you to weigh in. Do you think breaching the debt limit would be catastrophic for the U.S. economy? Vote below or by replying to our tweet or commenting on our Facebook post. Raising the debt limit IS breaching the debt limit... To repeatedly increase our self-imposed "debt limit" without taking steps to make sure we don't reach it is insane. Unless creating fiscal cliff crises every so often, so that they can in turn avoid them at the last minute, patting themselves on the back, is the point that is... Not ruling that out with this bunch. How in the world would the average citizen know what the impact of not raising the debt ceiling might be? That's what we hire government experts for, but I guess they are not working this week. How does anyone know because this has never happened before?? The government feels it's alright with wasting a trillion dollars if not higher a year on ridiculous things but no obligation to pay what is dire necessary to run our country. This is not how our government works or is supposed to ever be operating. American lose at least 40% of their checks to taxes since we are taxed on everything we buy or every bill we pay nearly all have taxes included. The people in the country work so hard, and have to live on so much less than we all should be living on but we manage. Our spending is not out of control because we have to live within our means. The government needs to stop printing money and borrowing money. John Boehner, all he is trying to do is besides making sure the bills is t are paid is to justify why there has to be so much borrowing. He is right. In the end, there's not going to be a default but the spending is out of control. Someone has to force, to make it stop. We are at the highest debt ever, and it's ridiculous! It can be stopped and it needs to be stopped. Everyone needs to do there jobs and stop asking for special interests or provisions just to move something forward. Everything attached to something that is not what your voting on is what's driving up the countries debt on top of the out of control wasteful spending, outdated programs, entitlement programs full of fraud an abuse ect...We are paying for empty building across all states in the US, that are serving no purpose at all the list goes on and on. Everyone needs to stop blaming "The Affordable Care Act". The problems are within our government. Everyone wants his or her way, no one wants to act like grown ups and take responsibility. No one is going to cave first either. In order to reopen up the government, it's going to take everyone to give in. Until then we will have to wait and see if something does happen or does not happen with the debt ceiling. What does raising the debt ceiling really mean? I have no idea. Why do we borrow money when the Constitution authorizes the government to print it? How did we run the country from 1787 until 1913 with no federal income tax? When it's reported that we owe China (and United Arab Emirates) a few trillion dollars, what does that mean? Did the fed Chairman and U.S. Secretarty of the Treasury walk into the bank of China and take out a loan or did the Chinese government simply buy up the same U.S. treasury bonds available to all Americans? In spite of having two college degrees, I cannot understand why our sovereign nation borrows money and what is meant by "national debt". Do Americans realize that we have been printing dollars since around 1957, with absolutely nothing backing them up? None of the news outlets talks about this... Please educate... I need it! Hi Matt... I see you DID study enough economics to have heard about the post WWI German inflation caused by flagrant printing of Marks. This occured because even companies were allowed to print currency. Salaries had to be readjusted during the work day. I'm not suggesting that. I'm stll of the mind that you can print money if you are careful as to its distribution. Afterall... we did it to fight the Vietnam War and beat the Russians to the Moon. I see no problem earmarking dollars to provide full employment and building up our infrastructure. Who can afford to go without work? Yes, Will be bad not just for USA but for the WORLD!!!!! Shame on those Republicans....They are against Democracy....they do not respect what was decided last NOV.
Republicans don't like democracy? That's the type of hateful rhetoric that is the cause of most of our problems. Republicans and Democrats will always have their differences... the key to democracy is the two sides coming together to resolve their differences and meet somewhere in the middle. The problem this time is Democrats aren't willing to give anything up to meet in the middle. Republicans have made multiple concessions to try to move the negotiations forward, but Democrats keep holding firm to all their demands. What exactly was decided last November? The people elected a Republican majority to the House in that same election. This idea that Obama has a mandate to do whatever he wants because he won the election is total BS. Labrador needs to be the one to negotiate not Obama. This guy is no leader. He is certainly not any presidential material if that's what he thinks he is. Boehner needs to make tea party fanantics like this irrelevent or he will be complicit in destorying our economy and future of the US position around the world that will for a start cost us many more billions in higher debt interest payments far exceeding any kinds of pititufl amounts they claim they are trying to save for their stupid ill informed tea party constituents. I loved the way ROSA DELAURO show the real issue on republic long term agenda: NO PUBLIC SERVICES FUNDED BY GOVERNMENT, NO TAXES FOR THE RICH! This guy Labrador and his tea party nuts have lost all sense of reality. Why are we in the metropolitan east and west coasts letting these mtn west and southern rual hicks potentally drive this country off a cliff ? The constituents of these tea party nuts like Labrador, Cruz and Lee who live in Idaho, Texas and Utah.must be morons. Labrador self righteious attitude is absolutely infuriating. The people in Idaho need to be taught a stern lessen that they elected a nut they will get nuttiy behavior that wil come back to haunt them one day !! Why is it that people who disagree with liberals in the Northeast and West Coast are nuts? This hateful rhetoric and name calling is at the heart of our problems. Liberals preach tolerance for everyone, yet they can't tolerate someone with a conservative viewpoint. I can't believe how opposing heads can go back and forth with the same talking points as if they were programmed robots just spewing out the misconceptions. I am outraged that the GOP (Grumpy Old Parasites) continue to misrepresent facts and the media including this program hosts do not correct those misquotes of misinformation. What is happening is unprecedented because when we had the last government shutdown, the debate was of budget cuts for the poor, middle class and tax cuts for the rich. Never, has one party shutdown the government because their hate for one man is above principle, love for country and disagree with an existing law that passed the House, Senate, President signed it and upheld by the Supreme Court. This riles the blood in my veins that is ready to give me an aneurysm because NO ONE, NOT ONE MEDIA OUTLET WILL CORRECT THE BS!!!!!!! Obama needs to stop trying to take our rights from us he tried with gun laws that didn't work then bullets from all retail stores that didn't work now Obama will try his Obama Care Program this is nothing but a joke if we the US people fail to sign on or take Obama Care Plan will be fined then IRS will be at your front door taking your bank and other assets hostage garnishing wages then tagging you with a criminal record possible jail time. By making the US people take this is like going into a restaurant wanting a steak dinner and they tell you that you will by the special or leave. Let the US people decide what they wan't we make the money let us spend it how we wish, saying more jobs Obama you need to complete the story lots of PART TIME JOBS this will not work if you care for our country then back off let us decide whats best for us. What? You do realize that the "part time" portion of jobs is already to that point because businesses dont want to pay for health care right? Do you ever wonder why? Maybe its because its too expensive! Obama had to do something when people have to file for bankruptcy because they cant afford healthcare coverage. The U.S. is the only first world nation without a universal health care plan. How can the richest nation in the world not have a fundamental right for all citizens. While the ACA is not perfect and is a train wreck, it sure is a hell of a lot better then doing nothing because nothing is killing the middle class Americans. I feel bad for ALL Americans because we are suffering at the hands of Congress. This pointing figures have to stop and Congress needs to get to work. PERIOD. You appear to be unaware that you ALREADY ARE paying for those who are not insured, passed along in higher premiums and medication costs..... ACA makes them pay their share and fines (taxes) them if they don't. Sure we have the "best" healthcare in the world.. if you can AFFORD it! It's why the WEALTHY from other countries come here.. it's also the most common cause of personal bankruptcy!! I fail to see why I should pay for your healthcare visits or be bankrupt by our current "for profit" system. ACA (which is a conservative plan BTW) is not perfect.. but neither was the original Constitution. That's why it was revised and had improvements (Amendments) made along the way. Time the GOP quit putting party ahead of country, trying to make Obama look bad (their daily objective) and work with Dems to get ACA fully operational. We can all benefit from that. Obamacare doesn't make anyone pay their fair share. The folks that couldn't afford insurance before Obamacare are going to receive subsidies to pay their premiums, so anyone that pays taxes is still paying for a portion of their healthcare whether they have insurance or not. Obamacare is really about wealth redistribution more than healthcare. It's not going to lower costs for anyone (other than through government subsidies). I don't think anyone should be denied basic healthcare, but just because the US has the best healthcare in the world, does that mean everyone should have access to the best care possible even if they can't pay for it? That's the question no one wants to talk about because it's such a political minefield. There are a lot of things I can't enjoy because I'm not rich. If I have a terminal illness and could live a few more months by going through a million dollars worth of highly advanced treatments, are those treatments a basic right of mine if I can't pay for them? No one can address that elephant because if you answer no to that question, you're suddenly a monster that is trying to push granny off the cliff in a wheelchair. I don't mind paying more taxes to provide healthcare for those who have none. It's not like they're demanding a Lexus vs a more affordable car... or taking the bus. We're talking about healthcare. I'm reminded of the words of John F Kennedy who said "We choose to go to the Moon, not because it's easy, but because it's hard!" Inasmuch as our dollars are no longer being backed up by gold or silver, have you ever wondered why we still pay federal income tax? Is it to run the country or just to throttle the economy? It is apparent to me that Rep Raul Labrador only cares about himself and his party, His suggestion to leave the govt shutdown going on for six weeks with just a temporary debt ceiling deal is just crap. Apparently he doesn't understand that the federal workforce is proud of their jobs and what they provide to the United States and with these employees not getting paid, Wow that is fair. It is a good thing I am unable to vote for Rep. Labrador because I would do everything in my power to get him voted out of office. A federal employee that cares about their job. So, debt ceiling bad....republicans don't want to travel that road. Keep government shut as long as republicans in the house get more cuts to middle class with NO compromise (er...conversation) on new revenues by the 1% of jerks who don't pay their fair share. Just watched about last 20 minutes of discussion on Shutdown. Excellent. At least we could hear both sides,, without shouting, interruption. Civil debate. PLEASE KEEP THIS UP. Actually not raising the debt ceiling might result to a catastrophic spill over effect on a global scale. Raising the debt ceiling won't be the first time for the US. It is the wealthiest economy on earth and it can take it. On top, a delayed resolution can only enhance a global perception of the US lacking credibility.